Happy 4th of July to our American readers! We hope you have a wonderful time celebrating independence with family and friends. Summer celebrations often include water, which the Duggars love! 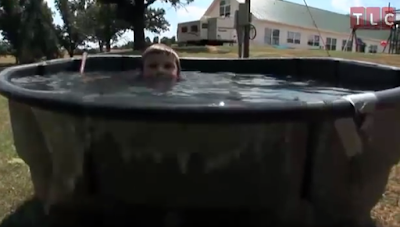 In this throwback video from 2011, the "middle" Duggar boys beat the heat in a unique way...swimming in a horse trough. Haven't the Duggars added a swimming pool to their house since this was aired? Not the next door 'pool guest house', but their residence? I think they did, but for some reason, keep that fact quiet. Why? I guess the kids in my family were trend setters; we were swimming in the troughs in the 70's. My parents took the hint (or maybe the horses rebelled) and a pool was installed in the backyard. I have always wondered why the Duggars never put in a pool. They have the room and it would give them the privacy they desire. Looks like fun but swimming in jeans? No thanks, I'll stick to my old lady bathing suit. disappointed i missed the show but your recaps are always excellent! thanks for taking a break from your break to post it!